Course leader and senior lecturer Charlie Watts is delighted with the developments so far, but there is no relaxing, and this is just one of the major stages of television development for the Creative and Cultural Industries (CCI) faculty, and for the university. Charlie states: When we first started, there was little belief that a television channel could be created, or work. There was even opposition to us producing live TV. There seemed to be a general opinion that Live was soon to become a thing of the past, and because VoD was becoming the accepted way of watching television, many thought we were taking a wrong turn. Thankfully, live transmission is still a valued commodity amongst broadcasters, and the broadcast of popular soap episodes live, event TV on prime-time Saturday evenings, and live science and nature programming to name but a few, have all helped convince both staff and students that we are correct to offer live TV as a discipline. The multi channel live broadcast of the Olympics last year certainly helped as well! The course philosophy is to simply do it for real, and this entails producing at least one live programme each week. Students are allocated TX dates, and placed in skills-based groups, and once the TX date is known, it is left to the students to produce, write, record relevant video inserts, and book the talent to front the show. Charlie adds: Its worth stating that this pressure of weekly broadcast is only given to third-year students, and the previous two years of study are all structured to give the relevant skills and abilities to help students become capable in their last year. 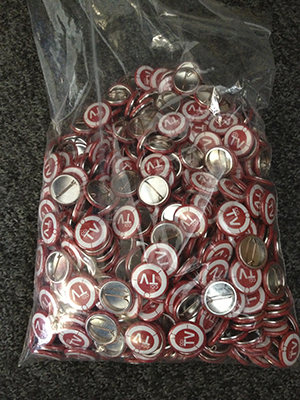 Its a decision we made when the course was first conceived, and its one that has served us well. I think its rare for a course to be able to deliver weekly live programming to a high standard each week, but any course responsible for a TV channel has to hit at least that expectation, otherwise we are kidding ourselves, and not doing it for real at all. The television channel is the main focus, and it is designed around exhibiting quality student work from the faculty of CCi. 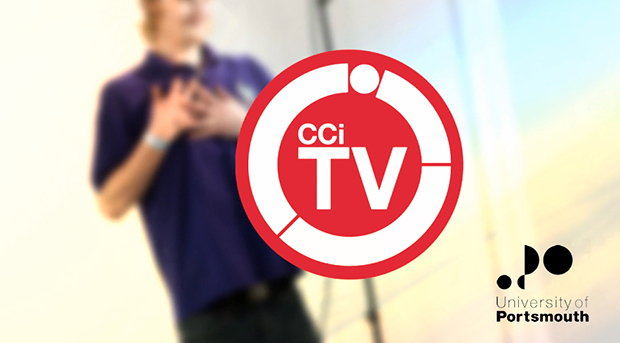 The CCi TV Channel has its own remit, a daily schedule made up of television content that has accumulated over the years, an identity and brand that students support via t-shirts and badges, and it can be seen 24/7 via the web (www.ccichannel.port.ac.uk). The pressures to continually run a TV channel are felt by everybody, and both staff and students are committed to the needs to generate content. Charlie is well aware of the pressures to deliver. Broadcast is a beast that is continually hungry, and it continually needs feeding, but that is the nature of TV. Thankfully our channel inspires both students and staff to always offer that little bit extra, whether it be their own work or their time, and we also enjoy fantastic IT support to keep operations running. The broadcast infrastructure is based upon a Capital Networks Audience TV server, a couple of NewTek Tricasters, and Sony EX3 cameras. Editing is done via quick turnaround in a matter of days using offline/online editing workflows and Avid MC 6.5, which are all connected to an Avid ISIS. This focus to be as professional as possible has gained outside industry interest that has also enhanced operations. Charlie adds: The operation of a TV channel should be very visible, and quite early on we realised that we needed to show outside industry what we were up to. This got us noticed by Gearhouse Broadcast, who were encouraged by our technical teaching and passion to champion outside broadcast. Gearhouse have been great, and they have offered support where possible, and this has opened up the door to other interested companies such as EVS, who we hope will become another important educational partner with us. Our focus on TV, and Live TV creation, is respectful to the big players, and we would be doing our students a huge disservice to not try and collaborate with proven industry experts. I think we need to do everything possible to show employers what we are up to, and this has led to students producing original TV programme formats that are eventually transmitted live in one final, huge show. For two years running students on the Television and Broadcasting course have transmitted a live show with multiple original programmes as part of the schedule. Charlie says: The first show was an uninterrupted four hours to all campus TVs, the web, and to the citys LOCOG Big Screen. This years show was to the same platforms, but six hours long, with an added simultaneous broadcast with an additional TX to a separate channel. All was an uninterrupted TX, with groups of students coming in at different times for their particular shift. There is always a panic trying to get students in and out of the studio on time, but that all adds to the atmosphere of live. Perhaps It's an old cliche, but live TV offers real learning without any safety net. Students actually have to be really well planned, and they need to know what they are doing. When it goes wrong, which it does from time to time, there is that golden period where the reaction and decisions of what they do next dictates success or failure. Harsh as it might be, whatever happens it is absolutely priceless for learning experiences. Yes its hard, and yes it can be traumatic, but one can only truly learn to ride a bike with the stabilizers off. Metaphors aside, this playing it for real extends to programmes having to have exact timings, and extensive paperwork for each programme. All copyright must be cleared, music cues listed, releases dated and signed, risk assessment covered, and programme running order decided. All must be delivered before TX, and no paperwork would mean no TX. This year will see the channel increase the live output to multiple shows per week, and final-year student projects are helping to fill essential management roles required by the channel. This year will see ten students all focus on a particular aspect of broadcast management, with roles such as social networking and merchandising coming online for the first time. Social network blogs have become a necessary requirement of broadcasters, and we would be foolish to not give exposure for many of the unsung jobs on offer. Our mission was always to be a true TV course, and not diluted by short experimental filming making, fiction, etc. Every year we widen our scope and look very carefully at trends in the broadcast industry that we can emulate in some way, which might lead to graduate employment. For Portsmouth it is all about offering a true and rich learning experience. That does mean very hard work with some unforgiving hardware and software, and high broadcast standards, but the course team believe that to do it any differently would be wrong, and would deny students the opportunities to develop into the professionals they want to be. Overall it is about getting the students employed, but also getting them to understand the big picture of what it truly means to broadcast content, to keep an audience informed and entertained, and the pressures of running a TV channel. We obviously do the latter on a smaller platform than other broadcasters, but we take it just as seriously, and the BBC and BSkyB have noticed us and our commitment to keep transmitting. Broadcasting live raises everybodys game, attitudes change, and the pressures bring a priceless atmosphere into the gallery and the TV studio. Everyone has their part to play within the team, and when the red TX light goes on, the only focus is the programme, and delivering it professionally. Next year students want to broadcast a final-year live show for longer than six hours, and providing the older staff can have a chair to relieve some of the stress, and medication nearby, Im sure we can help them accomplish their aims.